The ensign in regular use is a normal Blue Ensign with a white lighthouse. Northern Lights is the General Lighthouse Authority in Scotland and the Isle of Man. Trinity House is the General Lighthouse Authority for England, Wales, Channel Islands and Gibraltar, and responsible for pilotage throughout the UK. Amongst other flags, it has a defaced Red Ensign, which 'ought to be' blue. Until 1864 vessels in the service of certain UK public offices defaced the Red Ensign with the badge of their office. In that year they were directed to transfer the badge to a Blue Ensign. For some reason Trinity House didn't do it and still have their badge of four Elizabethan ships quartered on a rectangular panel, applied to a Red Ensign. The new version of this flag has a shorter "stubby" lighthouse which makes good sense as it is more visible and distinguishable than the slender Bell Rock one. The Board is constituted in accordance with an Act of Parliament passed in 1786. 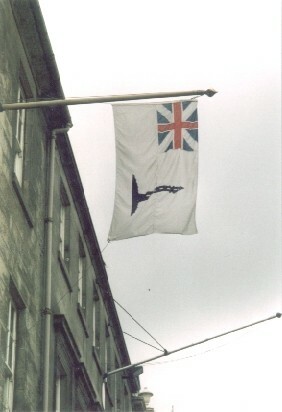 Their flag has a white field, two by one, with the Union Flag (1606 pattern) in the first quarter, and a representation of a lighthouse, in blue, in the fly. There appears to be no record of the date of origin; however, in the absence of the St. Patrick's Cross in the Union, it seems probable that it was adopted before 1801. It is flown at the main masthead when the Commissioners are embarked; in addition, they fly their "Pennant" at the masthead. The title of the last mentioned is rather misleading in that this flag functions much in the same way as a house-flag or yacht burgee. It is blue and bears a white cross, charged with a very narrow red cross; in the first quarter, the lighthouse in white. The Ensign is the Blue Ensign defaced with the lighthouse in white; this is worn in tenders and flown on lighthouses and depots on shore. It was adopted in 1855." Am I right in thinking that the Commissioners of Northern Lights flag is the only flag using the "Old Union Jack" (with no red saltire) as a canton? From memory, and possibly this is no longer true, but I think the answer is yes. 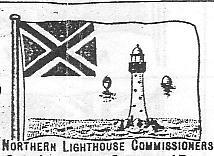 The Commissioners of Northern Lights is the lighthouse authority of Scotland. According to my trusty Whitaker's the Commissioners of Northern Lights was founded in 1786, which might explain its anachronistic usage. I recently saw in Edinburgh a flag of the Commissioners of Northern Lighthouses; the Commissioner's flag. I was very interested in the fact that it shows the old pre-1801 Union flag. I took a photograph. is surely 2:3 or similar, and is far less than half of the flag's length. The illustration on this page is probably based on that in BR20, Change No.5 (prepared by Graham Bartram), which also shows the canton with proportions of 1:2. This as far as I know, is the nearest we have in the UK to an official image. It would also appear that the fimbriation to the St George is too narrow on the flag in question, as it has apparently been approximately one-third of flag width from the beginning? The earliest official image of the 1606 pattern Union Flag is dated 1707, and this has that width of fimbriation so it sounds as if a little imagination has been at work? Neither is there any real justification for the canton proportions of 2:3. This, indeed, would have been roughly the ratio of jacks c1700, but the official illustration of 1707 shows proportions of 3:4, while about 4:7 (or slightly longer) would have been customary by the middle of the 18th Century and 1:2 by its end. "Why do our Commissioners' Flags bear the Union Flag of 1606 when the Commissioners of Northern Lighthouses were incorporated in 1786? The answer is surprisingly simple, bearing in mind the Royal Proclamation of 1801 (which introduced the present Union with a red saltire). The Commissioners decided in 1803 that as there was a large stock of the old flags still in existence they would not restock until the old flags were used up. From fiscal prudence are traditions born - it came to be that the Commissioners continued to wear the old flag. Our tenders wear the flag flown by Government vessels. 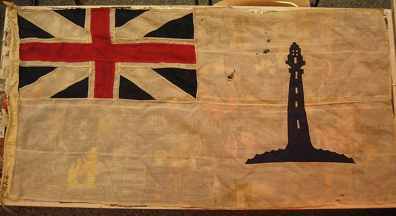 This is described as 'a Blue Ensign defaced with a lighthouse symbol in the fly' and this rightly bears the present Union Flag." However this leaves some other questions unanswered. Why was the flag white? Was it always the Commissioners' Flag, or did it originally have some other purpose? When, after 1801, did the Board begin ordering new flags with the obsolete canton? The defaced ensigns/jacks of ships operated by various commissions before 1864 were red, but since lighthouse boards were not specifically mentioned in the Royal Proclamations that introduced the defaced Red Ensigns, the Northern Lighthouse Commissioners may have felt free to devise their own ensign, and chose to have one in Scottish colours. It may even have been an allusion to the flag of an Admiral of the Scottish Navy, which until 1707 was a blue anchor on a white flag. If the "large stock of old flags" was particularly large and the flags used only on special occasions and carefully stored, the stock could have lasted for many years. Perhaps the flag did not become specifically the Flag of the Commissioners until after the Board's Blue Ensign was adopted ? According to "Flags of the World" books edited successively by H.Greshan Carr, E.M.C.Barraclough and W.G.Crampton this was 1855. However that was nine years before the Order in Council that made the Blue Ensign defaced with the badge of office the proper ensign for vessels employed in the service of any public office, and a more likely date of 12 December 1885 is in Malcolm Farrow's "Colours of the Fleet". "Although Jacks are not discussed in this paper it should be noted that public service departments are authorised to use a square version of their Blue Ensign as a Jack. Currently only RFA, RMAS, Marine Society and NLB vessels are believed to do this." The pennant is blue and bears a white cross, charged with a very narrow red cross; in the first quarter, the lighthouse in white. Note that the 3 windows on the lighthouse in canton are "filled" deep blue whilst the white lighthouse which defaces the blue ensign shows these features only as a deep blue outline. The more slender lighthouse on the older versions of this flag are based upon the lighthouse on the Bell Rock in Scotland. Note that the red cross is thicker on the new version of this pennant. This variant has a wider base, and more windows. And with more detail you'd see the structure is different as well. This version is visible on the internet as a quite new flag in several places, but nothing looking as original as this. On Flags of Empire is another specimen: http://2.bp.blogspot.com/-NMh8Kb8HCyw/TgoaJ7jyoiI/AAAAAAAAgpA/Qlp3URjQT4c/s400/1. Apparently, the fact that most had to be produced locally lead to some variation, as this one is fringed and has "CROYDON" below the emblem. And then there's http://web.archive.org/web/20130612060340/http://i602.photobucket.com/albums/tt104/vor033/daily pics/c0f8c277.jpg, but I don't know how to trace that to the annotation page that no longer exists either, but may have been archived as well. The details of the lighthouse will have varied over the years of course, and the nearest thing we have to an official image of the current version can be seen on Graham Bartram's site at http://www.flags.net/UNKG13.htm (since he is the Editor of BR20 (the MOD publication). The only way to (very approximately) date a flag bearing this design is to compare the actual flag with the various copies of BR20 (Flags of All Nations) that have been produced over the years. Overseas lighthouses were the responsibility of the Imperial Lighthouse Service of the Board of Trade. The Bahamas office looked after not only the lighthouses on the Bahamas but also that on Sombrero, a small island that was part of the St Christopher-Nevis group of the Leeward Islands. The tender based at Nassau flew a Blue Ensign with a badge that consisted of a lighthouse within an oval belt on which BOARD OF TRADE was written in white on red. The belt was surmounted by a crown, with a red scroll above, bearing the word BAHAMA in white. This was an official flag warranted 20 July 1898, but it is possible that the Colombo office had a similar, but unofficial badge with CEYLON on the scroll. It was more usual for colonial lighthouse tenders to fly the Board of Trade Blue Ensign with the sailing ship badge. The Bahama/Sombrero badge was flown by the tender Ana Patricia until about 1971 when it was replaced by the Board of Trade Blue Ensign [Bahamian Symbols by Whitney Smith in The Flag Bulletin XIV:2-3], but the lighthouse at Sombrero, on special occasions, flew the Wheel and Anchor Blue Ensign of the Ministry of Transport, which had taken over the Board of Trade's transport responsibilities in, I think, the early 1950's [Public Record Office document MT 45/580].